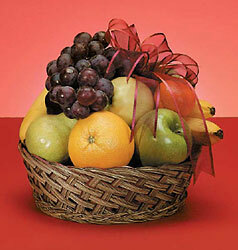 All our fruit baskets are custom-designed. We select top-grade, quality fruit along with gourmet food and snack items. The assortment of fruit changes according to the season, but usually includes grapefruit, oranges, three varieties of apples, pears, kiwi and grapes. The baskets are wrapped in cellophane, and tied with a bow.